Would JFK Be A Democrat Today? Home Campaigns & Elections Would JFK Be A Democrat Today? Fifty years ago this week newly elected President John F. Kennedy delivered his Inaugural Address. Written mostly by Ted Sorensen, who passed away last year, the speech was a memorable one, not only for its content but for the youthful enthusiasm and energy in delivery, by the youngest elected president. Reading through it, and listening to it anew causes one to consider the probability that JFK wouldn’t have the same party affiliation if he were alive today as he did in 1961. The most frequently cited line from that speech was, “Ask not what your country can do for you, ask what you can do for your country.” This aphorism was immediately engraved on the American psyche, collectively and individually, and has become timelessly and indelibly impressed in our minds. As truthfully as it rings to us all, we’re obviously far removed from that mentality today. Either through control of purse strings or by regulation, the country now does much more for us than we do for it. It provides our education, owns the entire student loan industry, controls the banking and financing industry, controls health care delivery and the health insurance industry, owns much of the auto industry and controls the rest of it, controls much of our energy apparatus, controls much of our food production system, and manipulates our currency value by printing more of it. It is indeed difficult to find any aspect of our lives that is not controlled, owned, or affected by government. Another notable line from that memorable address was, “We shall pay any price, bear any burden, meet any hardship, support any friend, oppose any foe, to assure the survival and the success of liberty.” Sounding much like George W. Bush, we can’t help but realize how far removed we are today from that conviction. “Oppose any foe,” but we can’t profile or identify the religious orientation of those of our enemies who are motivated by their extremist Wahhabi ideology. “Support any friend,” which among nation states typically refers to allies, but seemingly less and less applied to our staunchest ally in the Middle East, Israel. Hardly a week goes by without someone prominent in our government or that self-proclaimed bastion of human rights, the United Nations, for one reason or another castigating, criticizing, or condemning our “best friends” in that region of the world. Kennedy’s idyllic line calling for a united world to “explore the stars, conquer the deserts, eradicate disease, tap the ocean depths,” has newfound meaning when we come to terms with more current verities. “Explore the stars’ is now unlikely with the discontinuation of the Shuttle program and no replacement in sight, and a newly stated primary objective of “Muslim outreach.” Much disease has been eradicated since that time, and we’re still working on conquering the deserts, but we can’t “tap the ocean depths” if we’re looking for oil, per Obama’s Executive Order. Words have meaning, and composed as they are in the lofty, historical settings of Inaugurations, they are designed to inspire, motivate, and provide direction for a country. If they are as timeless as we assert they are, it is incumbent upon us to review and recommit to those timeless ideals and principles. 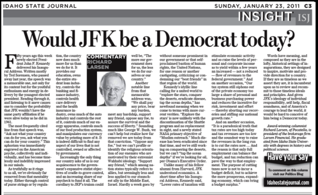 And given JFK’s ideology of individual responsibility, self-help, fiscal soundness, and of America’s courage to lead the world, it would be hard to conceive of him being a Democrat today.